Christie and Arvid performed improvisational/experimental electroacoustic music and other genres using voice, electronics and horns. Christie has a background in classical voice and opera and Arvid in jazz, electronic and experimental musics, playing both trumpets and computers. 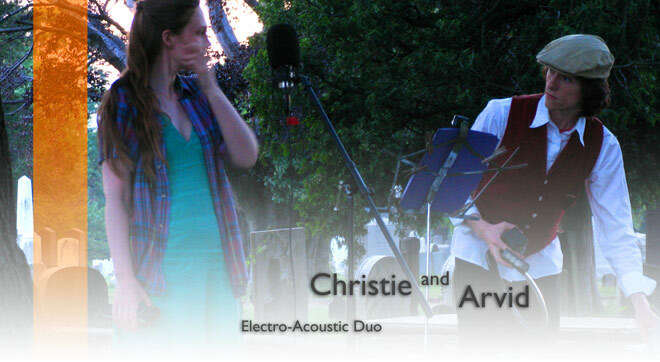 Christie’s beautiful singing and diverse vocalizations are augmented and affected by Arvid’s trumpet playing and live electronics, including an expressive one-of-a-kind wireless electronic wind controller designed and built by Arvid himself. Performances involve the very oldest instrument (the voice) and some of the very newest (Arvid's electronic instruments). The second public performance of "Awakenings", our potpourri of pithy poems about sleep and awakening set to original electroacoustic music. "Music on the Fly" is an Exclaimation Point evening presented by The Fort Point Theatre Channel. "Awakenings" - A potpourri of pithy poems about sleep and awakening set to original electroacoustic music. A digitally augmented requiem mass for the inhabitants of the North Burial Ground, performed on-site, among the gravestones at the North Burial Ground in Providence, RI. Christie Lee Gibson - Voice, Arvid Tomayko-Peters, Trumpet, TOOB and electronics. Watch for another performance of Requiem Aeternam at the Pixilerations Festival this October in Providence. Christie Lee Gibson and Arvid Live at Pierre Menard Gallery, Cambridge, MA - Two Pieces recorded live 4/19/07 at a performance for Jim Peters' opening. Christie Gibson: voice and electronics, Arvid Tomayko-Peters: cracklebox, no-input mixers, tape loop.